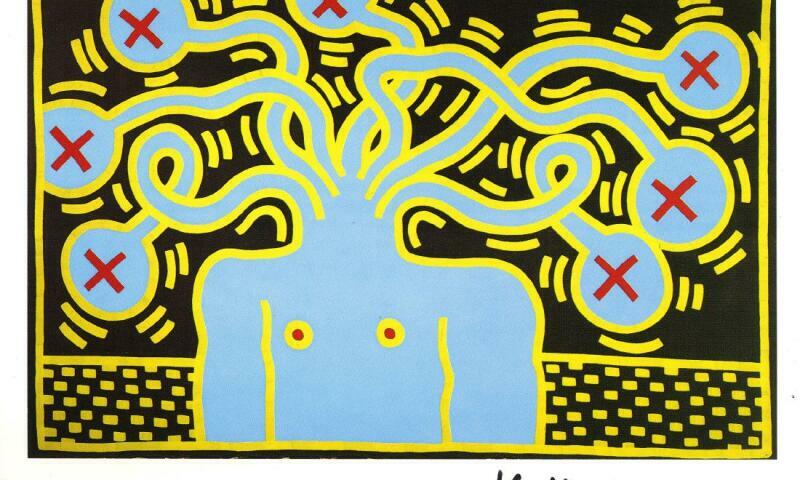 Keith Haring was born in Pittsburgh, in 1958. He drew incessantly, first inspired by the Walt Disney cartoons and Batman comics as a child, and by the sounds of Led Zeppelin, Aerosmith and the Grateful Dead in his adolescence. He moved to New York in 1978 to continue his studies. Like the Futura 2000 graffiti artists and Jean-Michel Basquiat, with whom he became a close friend; Haring spent his nights in the subway covering its billboards and trains with his drawings and paintings. He participated in the first show to be uniquely dedicated to Street Art, at Club 57 in 1980. After this he presented his works in a series of shows all over the world. He was in Japan when he learned of the death of his friend Jean-Michel Basquiat on the 12 August 1988 after an overdose. On the flight home he noted that his skin was covered with marks which he immediately recognized as the symptoms of AIDS. With two years left to live he focused the time he had left on monumental public commissions, sculptures and wall-paintings. The exhibition brings together an important number of works by this renowned American artist.